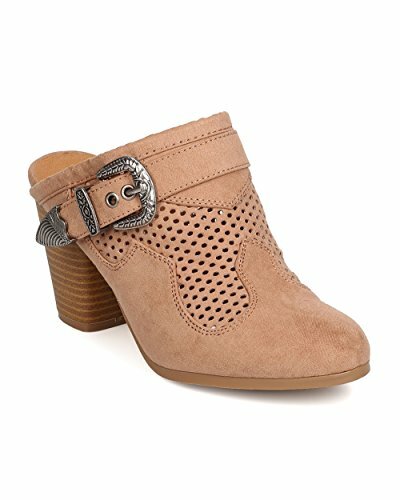 Designed with faux suede upper, round toe, stitch accents, perforated details, faux buckle feature, faux wooden chunky stacked heel, and easy to slip on design. Measurement (tested sz 6; approx. ): Heel: 3", Fit: FUNS SNUG, please consider ordering a half size larger, Brand new with original or Alrisco shoe box. If you have any questions about this product by Qupid, contact us by completing and submitting the form below. If you are looking for a specif part number, please include it with your message.